By the time you’ve finally broken in your climbing shoes, you have spent quite a few good sessions getting them nice and sweaty and used. 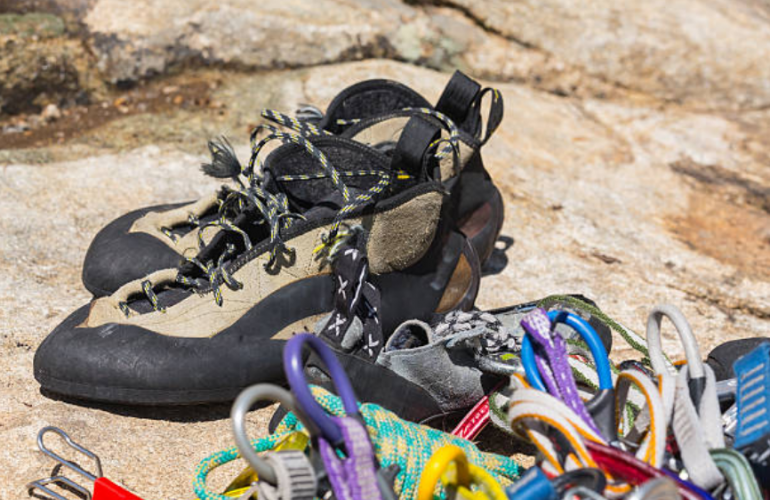 You’ve likely gotten used to your climbing shoes and are loving them, but you’re also bound to start noticing an offensive smell show up every time you get near them. 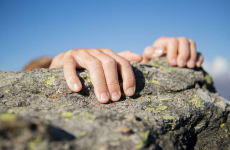 Climbing shoes smell is a common problem experienced by many climbers. Due to their tight fit, being worn with bare feet, being used during intense exercise, and then commonly stored in a climbing pack or in the trunk of your car, it’s no wonder they are a bacteria breeding ground. So, what can you do about your stinky, funky climbing shoes? Fortunately, you can take a preventative approach to help minimize climbing shoe odor from overtaking your nostrils. Wash your feet really well immediately before putting them into your climbing shoes. Use soap and really scrub them. Tea Tree Oil also works really well to kill foot bacteria. This is probably easier to do at the gym than it is if you have a long hike to the crag in your approach shoes. Even if you can’t do it right before changing into them, at least do it right before you leave. Some people use a hand sanitizer on their feet to help kill the bacteria. This is a great option if you have no access to running water right before changing in to your climbing shoes, and it is are good to use sanitizer in addition to washing your feet after you do. Some climbers use a regular antiperspirant spray on their feet to help keep them from sweating in your shoes as much. Some climbers use chalk on their feet for this purpose as chalk is great at drying out your skin. The best chalk for applying to your feet before putting them into your shoes is a liquid chalk like Black Diamond Liquid White Gold, FrictionLabs Secret Stuff, or SportmediQ Liquid Chalk. If you take your shoes off during rest periods, you can re-apply it each time you put them back on to add to the effect. 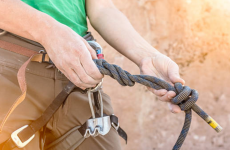 Wearing sock in your climbing shoes is always a possibility, but most serious climbers won’t like this suggestion because it could reduce performance. The reason climbers don’t like to wear socks in climbing shoes is because you want the shoe to feel like as close of an extension to your feet as possible. Any slipping or moving of the shoe could result in messing up a move. At the very least, make sure you have fresh socks on your way to the gym or the crag so you’re not changing into your climbing shoes from sweaty socks. Never stuff your sweaty shoes inside your climbing pack immediately after use. It is a much better idea to clip your climbing shoes to the outside of your pack, as it will allows the air to dry them. You can also dry them briefly in the sun, but don’t leave them out so long that the UV starts to wear the rubber. You see climbing gyms spray the rental shoes with a Lysol Spray after each use. This kills the bacteria that can lead to smelly shoes. If it works for shoes being shared by lots of different people, it’ll work for your own pair being worn by only you. Try not to store them inside your pack, or locked in the back of your trunk while not in use, especially in the summer. It is best to hang them in a cool, dry location. 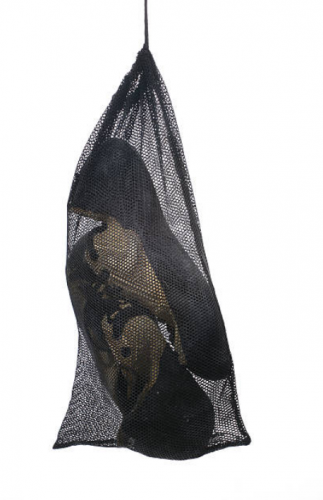 A mesh bag is a great idea for storing and carrying your climbing shoes. There are a lot of things you can put in your climbing shoes when you’re not using them that will help soak up wetness and odors. Some people stuff dryer sheets, crumpled-up newspaper, boot bananas, or charcoal inserts into their climbing shoes when they are being stored. Another common recommendation we hear a lot is to spray your shoes with Febreeze before you put them away. While some things work better for different people, you can always try them all until you find one that works best for you. Some people do throw them into the washing machine, but this could damage your shoes, depending on the shoes and the machine. It is safest to wash your climbing shoes by hand. Fill a bucket or your bathtub, and use soap or a detergent made specially for removing orders such as Revivex Odor Eliminator. Don’t put your shoes in a hot dryer as this could damage the rubber or shape of your shoes. Let them air dry although this could take a couple days to fully dry. You can dry them outdoors but don’t let them sit in the sun too long. Having two sets of shoes is a good idea so that if one pair is drying you can still climb, and you can alternate washing. White vinegar is a great disinfectant and a deodorizer. Simply soak your climbing shoes in a bucket of vinegar for about half an hour before you wash them. You can dilute the vinegar with water. The vinegar treatment will make a big difference and also help prevent the stink from returning longer. After rinsing them, you can then wash them like you regularly do, whether that is scrubbing them by hand or throwing them in the washing machine. By following these tips you can greatly reduce the offensive odors that come from your climbing shoes. We’ve talked to a lot of climbers and these were their most popular suggestions. What other things or products do you use to help control climbing shoe stink? Let us know in the comments. You definitely need to target both feet and shoes. Too often people clean their shoes, then stick their stinky feet straight back into them! I’ve found a combination of HibiScrub and a good Ped Egg work wonders.